Journey Into Nyx spoilers are in full swing. In another week or two we’ll have the full list, and at that point I can give you guys a complete rundown of the set and what we’re looking at. In the meantime though, I figured I’d double back to my Theros review and see how I did. It’s been just about seven months, which is plenty of time for us to understand as much as we will about these cards before rotation. Chained to the Rocks is poised to be one of the strongest removal spells in the format, especially with how good decks with Sacred Foundry look at the moment. I see it available for about $2.50 on TCG Player as of 9/23/13, which likely is fairly close to its floor. Mizzium Mortars never really sunk below $2 retail, and I think Chained compares pretty well. The ceiling on this card isn’t particularly high though. While it’s quite a powerful effect, you still need to have actual Mountains (and a good deal of them) to use it, not just lands that tap for red, such as Clifftop Retreat. I can’t imagine this breaking $5 for longer than a week or two, if ever. The best strategy regarding this card will simply be picking them up in trade for $1-$2 and trading them away at $3-$4. This feels like a pretty reasonable read. They’re about $1 to $1.50 low on TCG, which is right about where I expected them to be. My advice on how to trade them seems to have been appropriate to. I’m putting a check mark in the success column on this one. I didn’t really give you guys a specific price, but overall I thought she was powerful and relevant. I wasn’t entirely sure if the rest of the Standard community would pick up on that immediately, but in hindsight they clearly did. Overall I think this was a pretty reasonable evaluation, if perhaps a bit prudent. Fabled Hero is about $1 on TCG, which is on the lower end of my expectation. I was a little more bullish on this guy than the rest of the world was, but I also didn’t foresee the format becoming a wasteland of Hero’s Downfalls. I doubt rotation will change too much since all of the excellent removal is in Theros, not Ravnica. I’m hesitant to call this a miss, but it’s certainly not a success. Intro deck rare. I love the card, but do not buy into this with the intent of profit. Heliod reads to me as the second weakest of the five gods…The gods are a little tricky financially. They’re almost-sorta a new card type, and subsequently I don’t feel like I have a good gauge for how their casual support is going to be. If I had to take a guess (which I suppose I do since I’m writing this article), it’s that the gods in general will be more popular with the casual crowd than the average decent mythic. I feel like the floor on Heliod – and all the gods – is probably around $5-7…My opinion on the gods, and other cards in general of which I’m not confident in my predictions, is to ship them early and wait until I understand them better. I was pretty accurate in regards to the power level here, although Heliod is arguably the weakest at this point. I set their floor a tad higher than it turned out to be, but not by much at all. I’m glad to see I advised caution when considering what to do with them early in their life span. I guess my call on the floor was a little high, so I’ll mark this as a miss that I don’t feel too bad about. Boy, Savannah Lions has come a long way, huh? Remember that we just came out of Ravnica, so “Protection from multicolored” reads a little better now than it will in a year. It will still probably be in discussion for any Modern white weenie deck, so if you can find Craig Wescoe, you know you’ve got a buyer. Other than that, your white one drop has to see heavy, sustained play (think Champion of the Parish) to maintain a $4+ price tag. I told you that he looks better immediately after a mono-multi block, and then I told you it’s unlikely he would maintain even a $4 price tag. I’m pleased with this summary. Artisan seems very weak to me. These days, a ton of the value in good creatures is their ETB effect, which Artisan doesn’t get you. You also have to do a lot of work to even get the clone effect. Bulk rare; trade away accordingly. Yep, I completely missed on this one in terms of playability. It is clearly better than bulk, having been in Mono-Blue for the better part of six months. Still, the price is well under a dollar. I was way off on how playable it would be, but still right on the price. Half miss, I suppose. Bulk, unless they reprint Aether Flash. I have a lot of trouble seeing Master accomplish much. Blue token makers are fairly rare, but creatures that die when their Master dies just seem miserable. Given the current state of blue, what permanents do you have in play that give you a healthy amount of devotion that are not already putting the game away for you? Welp. That’s a big ol’ stinky miss. I completely under-evaluated how powerful slamming even two or three tokens into play would be, much less five, six, or even more. What I should have said was that for four mana you get a bare minimum of two 2/1’s, one of which has a very relevant protection, and that the rate isn’t embarrassing at all when you consider how well he scales up. Instead, I focused on how little blue was playing to the board at that point and made a sweeping generalization. I understand why I said what I said, but clearly I need to be a little bit more welcoming of powerful effects that I don’t see an immediate application for. THE TEEF will never be a four-of. I’d say $2 at his absolute best. This is satisfactorily a success. I believe Thassa is quietly the best god in the set. Purphorous and even Erebos are getting a lot of chatter, but most Thassa discussion has been less high-energy. However, I believe this is due in part to people underestimating the power of scrying every upkeep. In discussions with other players, the common opinion seems to be that the fair yet still playable cost for an enchantment that was just the upkeep scry would be 1U. That effectively means you’re getting the entire rest of the card for one colorless mana. Not competing with Jace or Supreme Verdict on the mana curve is also a great position to be in. When you finally do get Jace down, all it takes is UU somewhere to suddenly be within range of closing the game out fast. Notice that Thassa is capable of making herself unblockable. I feel pretty good about this one looking back at it. I was basically completely correct, with the sole exception that I was hoping she may get cheap before people realized she was the real deal. What in truth happened was that she hadn’t really gotten much cheaper than maybe $18 when the Pro Tour happened and she skyrocketed to something like $25 or $30. I didn’t really give you a long-term plan on her, but I don’t feel too bad about that. I knew she would go up, and after that it would be all metagame. In any case, I think I gave a pretty good evaluation overall. I’ll take this success and be happy with it. This card seems fantastic to me…Agent of the Fates is $2 on TCG Player while I write this, which is almost low enough for me to just start buying copies. If he gets under $1, he will be a major trade target, and under $.50 I’ll start in with cash. Hot off the heels of my great Thassa prediction is my rather shameful outlook on Agent of the Fates. I was clearly wrong about this, as he’s done nearly nothing since the format’s inception. There are indeed copies on TCG for around $.50 and I’m not rushing out to buy them, so I certainly am not as big a fan as I used to be. There’s a silver lining here, and that’s that Agent of the Fates feels like a victim of the metagame. Mono-Blue and Mono-Black just poop all over his face for a variety of reasons, but he’s still rather powerful in a vacuum. Wizards gave us all sorts of great BW heroic things such as Hero of Iroas, Nighthowler, and Herald of Torment, the latter two having already proved their mettle in battle. I’m not purchasing any today, but I’ll be keeping my eye out to see if he pops up anywhere before rotation. I was wrong up until now, but I’m keeping a candle lit for this one. Erebos has been the second most popular god so far, and I’m pretty sure that is due entirely to people not realizing how high of a cost his draw is. Two life is not an insignificant amount of life to pay to draw a single extra card. Yes, it’s repeatable, but the toll adds up fast. The ability is strongest late in the game, when both players are already limping. I don’t think the ability worthless, but I get the impression people read the words “draw a card” and ignored everything to the left of the colon. On top of that, his static anti-lifegain clause goes from “highly disruptive” to “niche ability” with Thragtusk rotating. Erebos was an easy $12-$15 at release, and he’s a weak $8 today. The absolute best circumstances for him has been realized with Mono-Black being the best deck in Standard, and he’s still only a one or two-of. I’m happy with my review of this, especially in noting that the card draw ability isn’t as strong as people thought it may be. I was completely right that this would be a major player in Standard, although I was way too prudent about the price. In my defense I don’t think we’ve ever seen rare removal get that expensive before. It’s down to $4-$5 now after a few months well over $10. I was right about how playable it would be, but wrong about how expensive it could be. I’ll take this as a miss I’m ok with, and be well aware of just how expensive Standard rare removal can be these days. Possibly playable card that I doubt will ever crest a dollar. I bring it up because it’s the Game Day Top 8 promo, and it looks super sweet. The promo will likely hold value better than it’s playability would have you believe because of this. Nighthowler is still under a dollar, but he’s been creeping up for the last week or two. Regardless of where he ends up in the next year, I think I was a bit too shy on his power level. My comment about his promo copy being a harbor of value was accurate though, with copies easily over $6 right now. If Nighthowler does indeed break out harder, the promo will just keep on moving up. There’s really not too much to say here. Thoughtseize is and will be a Standard, Modern and Legacy staple. Expect Snapcaster-esque prices for the next two years. I was clearly right on the power level. I’m not entirely sure how much I like my financial prediction, as Thoughtseize has gotten cheaper than I probably would have guessed it could in September, but I suppose Snapcaster behaved quite similarly. This is a success, but perhaps not as strong as I would have liked it to be. Cool card that’s in an intro deck. If it hits the Standard scene, don’t look to profit on this, but rather the other cards it will be dragging out of graveyards. And yes, it does work as well with Obzedat as you’d like it to. This is entirely non-committal and really tells you very little, so I’ll call this a miss. For Journey Into Nyx, I’ll try to provide a little more concrete expectations. Possibly a better Slagstorm depending on what you’re in the market for, and an effect we have been desperately in need of. (Take that, you lousy Burning-Tree Emissary decks.) This has bonus points for being impactful in Modern. I see no reason to expect much price behavior different from Murderbore. While I was correct about it being a strong card, even in Modern, I was definitely wrong on the price. Why? Well, for starters, I come back to the metagame. Both Mono-Black and Mono-Blue shrug this card off entirely, meaning it’s seen more play in Modern since it came out than Standard. Between my expectations that this would see more play than it does and my failure to predict $15 Murderbores, I gave you faulty pricing information. Sorry guys. Maybe it’s because I’m not a Jackal Pup kind of guy, but I really don’t care for this much at all. I’d ship these fast and avoid down the road. People tend to remember old cards, or new cards similar to old cards, a little too fondly in vastly different formats than when they were originally good. Remember when Nantuko Shade was like $8 preorder or something? Currently at about $.50, I feel good about this one. Solid looking card, but falls into the Koth trap of mostly being only good in really heavy red decks. Even if the card is fantastic, how many Hammer of Purphoros decks can there really be? I wouldn’t take the risk of trying to make money here; there’s better places to put your gaming bux. I’m pleased with this as well. I correctly identified that the mana cost was going to be far too prohibitive for meaningful growth. I will say right now that I am less enthralled with Purphoros than many others are…I wouldn’t be surprised to see him alongside Boros Reckoner and Stormbreath Dragon in the near future…I don’t doubt that he’s very powerful, but $25 will be a very difficult price tag to maintain amidst a lot of other very competitive-looking mythics such as all three Planeswalkers, Stormbreath Dragon, and Thassa…In any case, I’d be trading these away ASAP. The odds that he loses a lot of value are far greater than he gains any. If he slips towards $10, feel free to start grabbing them, because someone will probably give him a breakout performance at some point. Overall I’d say I did pretty well here. I was correct that he didn’t end up being as powerful as others thought he would be. My recommendation was that he couldn’t maintain his price, and to get rid of them. I told you to come back around once he got down to around $10, and I would still be comfortable telling you to trade for them today now that he’s around $7. I think in general I expected the god’s floor to be a bit higher than it has been, but on the whole I think I did a good job with Purphoros. This card is the real deal…As I see it, Stormbreath is poised to step in and assume Thundermaw’s role without missing a beat. Preorders have jumped from $15 to $25, and I don’t think that’s an unreasonable number for him to hang around at. Thundermaw hit $50 for a period, and if Stormbreath comes out of the gate terrorizing heros, I would expect no different. At this point he’s too expensive to buy into to spec on, but if you want a set, I wouldn’t hesitate to trade for him. I doubt you stand to lose much, and his upside is very high. If he dips below $15 again, I’d start snatching them wherever possible. I was quite bullish on Stormbreath. Perhaps a hair to bullish, I admit. 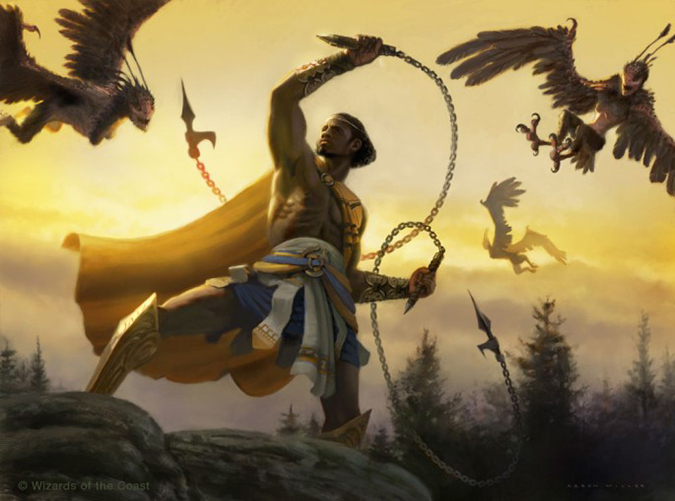 He has managed to rule the skies since Theros though. Dodging Archangel of Thune and Detention Sphere has in fact been relevant, and I can’t help but think he would have been even better than he has been if it weren’t for the menace of Blue and Black. I think I was afraid of telling you he’d “only” be $20 and looking timid when he hit $50, so I left the door open on that. I suppose I could have tempered this prediction a little bit more. He maintains a solid $20 price tag though. I like where I left you with this one. Even though there’s a lot of chatter about Boon Saibot, he’s still only $2 right now. Keep in mind that Loxodon Smiter has seen significant play in Standard and has even broken into Modern yet is still currently only about $4. There’s a real limit to how expensive an in-print rare can be. It will be tough for Boon Satyr to maintain a price over $4-$5 while he’s in the current set even if he’s seeing excessive Standard play. However, if he is consistently putting up results over the next year or is prevalent at the Theros Block Pro Tour, look to start snatching them up next summer when he’ll be at a low. I was right that he would have a heck of a time maintaining a price upwards of $4, but I didn’t tell you just how cheap he could be. I don’t feel like my prediction was wrong, but I didn’t give you enough information. I’ll call this a miss. Nylea is widely considered to be the weakest of the gods. I’m not entirely convinced that is true, but she certainly has an uphill climb to prove otherwise. On the one hand green decks that will want trample are likely to be strong devotion enablers, and she’s a solid beater herself. The activated ability feels very weak to me however. She’s $9 right now, and I expect that to start slipping very quickly. I’d say $4 is her absolute floor though, so if she gets that low don’t be afraid to grab a few sets. Even if she never gets there in Standard, it’s likely the gods will always maintain solid casual demand. This was spot on. She managed to show up just a little bit in a heavy green deck, but it faded away in the face of darker devotion decks. The $4 floor prediction was perfect, with several of the cheapest copies on TCG at exactly that number. Homerun. Polukranos is a powerful card that is going to be responsible for a lot of dead 2/2s and 3/3s. He’s in the Duel Deck though, so his price has a firm ceiling. While I’m seeing copies under $5, I’d guess is floor is around $2.50. If he slips under $3, there’s a lot of room for potential profit there with little downside. I also wouldn’t hesitate to trade for a set now for personal use, as again there isn’t that much to lose. And then I come crashing back down. While I was technically correct that his price had a ceiling, I was thinking he would be much cheaper than he ended up being. I guess I didn’t explicitly tell you he would be $3, just that if he got that low you should grab some. At the end of the day this feels like a miss though. [Exposition about Buy-a-Box promos]…A lot of people expect Caryatid to be a major part of the standard landscape, and I agree. She (?) is currently right around $5, which sounds a tad high. Like Daniel Boone, I expect there will be money to be made on Caryatid next summer. Correct that she (?) would see Standard play, but too prudent on the price. $5 is the lowest Caryatid has been, and she even hung around $7-$10 for awhile. Part of my read was that they would get destroyed much more frequently by sweepers, especially Anger of the Gods. With Anger not being too common in the format, it meant there was not a lot going on that could punish Caryatid. I was correct that the card would be frequently played, but wrong about the price. I’ll take my lumps here. Probably won’t be too expensive, but foils will command a premium. If it ends up being a 4-of in Obzedat’s Aid/Erebos’ Whip type decks, the price could quintuple very quickly though. Sounds about right. There’s still a 5x multiplier on the foil too. Many players I’ve spoken to are not wild about Ashiok, but I am quite confident Ashiok will be a part of the Standard landscape…Ashiok is still rather pricey at ~$18. I anticipate Ashiok cratering pretty quickly, as it may take time for Ashiok to find Ashiok’s way into lists. Once the number is below $10, I will gladly start picking up Ashiok in trade. Hrmph. I was a big fan of Ashiok, and I guess I still kind of am. She’s shown up here and there, but not enough to move the price much. To be quite honest I’m a little mystified here. Ashiok seems like she would be playable in variations of Mono-Black or even Esper. I like trading for her right now as well. I suppose this isn’t a miss per se, but certainly not a success. I’ll just say the jury’s still out. If a single thing on this card was missing, I’d be proclaiming it bulk. As is though, Daxos seems to have a lot of intriguing puzzle pieces…At $2, I’m not interested. If Daxos slips below $.50 though, I’ll definitely consider acquiring aggressively depending on if he’s appeared in any results. When a card ends up below $.50, the risk is just so low and the profit potential so high. Another victim of the metagame. He’s powerful for sure, but Pack Rats and Frostburn Weirds just stonewalled him entirely. I do trade for them were available though, so at least I’m following my own advice here. Like Ashiok, this doesn’t quite feel like a either a miss or a success. This could end up being the most overpriced card in the set. We already have something better than Watchwolf at the moment (Call of the Conclave) and nobody is playing it. The monstrosity clause is almost surely better than the state of being a token, but is it by any meaningful amount? Decks that play Watchwolf want to put guys into play and attack with creatures like Stormbreath Dragon, not spend their turn five mana to do one extra damage in a format full of good edict effects. There will be games where the monstrosity wins the game, but plenty more where you’ll wish you had just played Scavenging Ooze instead. I sold mine at the prerelease; I recommend you do the same. Fleecemane has done better than I thought it would, but the price has still been pretty lousy. Remember that during prerelease season this was around $10, so my call to ship them at the prerelease was golden. I admit that the monstrosity clause has been better than expected in a format full of spot removal. All in all I’m pleased with how I called this, although I recognize that it could be better than I originally anticipated six months from now. Nifty card that is almost surely unplayable in Standard. Foils will be worth a bunch for EDH. Bulk, yes. Foils are maybe $5-$6, so is that “a bunch?” Relatively I suppose it is. Potentially great card but he’s in an intro deck. It’s possible someone will manage to make money on him, but it won’t be me. Likely to be a much more relevant card in September given what we’ve seen of Block, I’m taking this opportunity to revise my previous dismissal. There is a LOT of enchantments floating around now, and it looks like the density of enchantment creatures has gone up in BOG and JOU. Given how good he’s been in Block decks, he may overperform at rotation. The intro deck thing is still very real, but I’m seeing copies under a quarter. I don’t like him at more than $.50, but if you can get them below that, I think you’re probably safe. This card seems to have a great deal of financial potential. There were only two other creatures in RtR that had three activated abilities: Deathrite Shaman and Lotleth Troll…I don’t think this card will necessarily be a major player in Standard for two years, but I do think it will see enough play to warrant a several dollar price tag at some point. Like Daxos, if this slips under $.50, consider me a buyer. My evaluation of Reaper was strong, so I’m pleased with that. I identified the fact that it wouldn’t be a major player in Standard for a long stretch of time, but that it may be good enough for a period to be worth a few bucks. MTGPrice is telling me it hung around $2 for awhile, which is on track. The printing of JvV has completely derailed any opportunity for profit this fall though, so my long-term prospects have fallen off. No way to predict that though, so overall I think this was a good one. Cerberus is one of those cards that has a lot of disconnected moving parts that makes him tremendously difficult to properly evaluate. Cards like this are notorious for being misunderstood early on because of their complexity, only to shoot up in playability (and price) once people realize just how powerful they are. I was cautiously optimistic here, and “cautiously” was a wise decision. Despite my reserved expectations, Cerberus has done exactly nothing. There’s still another whole year, but at this point it’s completely fallen flat. I don’t think I’m wrong when I say his ceiling is higher than his floor is low, but I suppose that doesn’t matter if we’re sitting there on the kitchen tile wondering where it all went wrong. My initial reaction to this card was quite poor. He read like a four mana satyr generator. As spoiler season marched on though, I began to see potential…Xenagos won’t even be the best GR Planeswalker in Standard, but he’s not as bad as I expected early on. His success will hinge largely on the playability of monstrous and monstrous-esque creatures. Expect Xenagos, Polukranos and Stormbreath Dragon to be best buds this fall. A safe price to trade in at will be $12 or so. I wouldn’t be surprised to see him follow Chandra’s price curve. I’d like to think this was reasonable. He has seen play alongside Polukranos and Stormbreath, but perhaps not as much as I thought he would. That again comes back to green being the worst color in the meta. It looks as if he’s $10-$11 right now, which seems to be about what I anticipated. I’ve been trading for them, and I’m confident he’ll at least make $15 before fall of 2015. All in all I’d like to call this a win. You need at least three devotion to break even on tapping this land, which is not a trivial hurdle. I can’t imagine this having much of an impact in standard. Even if it does make it into Standard, what are the odds it shows up in more than one list? Due to EDH, I see this as a $1-2/$10 nonfoil/foil split. Even if EDH drives up the nonfoil price, it will take years to happen. Get rid of all yours, pick up a foil one for EDH, and don’t look back. Hah, well, this is certainly wrong. The pile of Nykthos next to me tells me I changed my mind awhile back. I don’t remember how many weeks it was after I wrote this that I came around, but it was probably after the Pro Tour when I saw Mihara’s GR list using Nykthos to great effect. I’m a big fan of Nykthos now, and I’ve been stockpiling them for some time. I was completely and absolutely wrong here though; sorry about that. I don’t know why I didn’t look at this and realize that it’s a land that taps for more than one mana. Lands that do that are really worth paying attention to, especially in Standard, and especially when there’s a card that says “untap target land.” Lesson learned! This was my first real set review. It wasn’t perfect by a long shot, but I’d like to think that except for a just a few, most of my misses weren’t too far off the mark. Nykthos and Master of Waves were obviously real bad, but for the most part I just didn’t commit enough to a price or was a bit too prudent. I don’t feel too bad about that because advising caution is never going to be catastrophic. You won’t make buckets of money being cautious, but you won’t lose hundreds of dollars on failed specs either. At the end of the day, I’d like to consider this a reasonably successful first set review. I’ll be looking back at this as I write up my Journey review in short order and try to learn from my mistakes here, for my benefit and yours. Just a reminder, this blog can’t handle apostrophes in card links. While we all remember what Murder and Dreadbore do at this moment, people reading your article for research/nostalgia/whatever in the future won’t necessarily equate “Murderbore” with “Hero’s Downfall”. Leave that unprofessional stuff out of the section headers. Good article! This trend of reviewing predictions is an interesting development, and I wonder how long it will endure. I hope the trend continues. Articles like this are awesome in that they show the potential for learning from predictions. We can look back on them and learn something new all over again instead of having the predictions be fixated at one point in history.